It’s been a few weeks since the Scotland Trade Fair and it was an amazing experience to see all the makers and their products in one room. A first time to the trade fair for us, we’ve had some time to digest the experience and here’s our thoughts on the event as well as some more makers that we loved. Artisans of Scotland was born out of an experience with one artisan and an opportunity to tell their story. Since featuring handmade Scottish sporrans and releasing the sporran builder our ambition has been to tell more stories and work with more artisans. The trade fair was an opportunity for us to get to meet many more of these brilliant makers in one place so we were really excited to get over to Glasgow and see what Scotland had to offer. The first thing we noticed was the diversity in the products on display. Such a massive range of products in so many different industries, so much so that we spent the first hour just wondering the aisles trying to take it all in. It was really great to see and really encouraging for the future of made in Scotland. Products that used this country’s heritage and materials, that were so clearly Scottish sat next to all kinds of other craft that carried the badge of Made in Scotland and that was really exciting. Another take away for us was how open the room was. We arrived wondering how the day would go and what it would be like, and were blown away by how willing everyone was to chat about what they’re doing and tell their story. You’re maybe thinking that’s the whole point when you go to a trade fair, but this was our first and people’s openness stood out for us. We’re a friendly bunch us Scots, and it was great to see that on display at the trade fair. Our final thought goes out to food (that’s often the case). Wow, what a great showcasing of Scottish products on display and what fantastic quality throughout. We ate like kings with all the samples and came away feeling really proud of what Scotland has to offer. Some really great products and a great advert for Scottish food that often gets tarnished with a different brush when it comes to it’s culinary offerings to the world. That being said, let’s get back to craft, there was a whole range of fantastic craft and products on display and we came away really excited for how we can develop Artisans of Scotland. Here’s a few of our favourites. Tweed is undoubtedly a fantastic material, and it’s rise in popularity over the past few years has been incredible. It’s appeared on catwalks and been worn by celebrities the world over and unfortunately I think a downside of that is that there has been a bit of a kneejerk reaction to throw tweed on every Scottish product! Sometimes this has been done with little craft or consideration for the end product, and whether the material suits. With that in mind, we really enjoyed seeing some really carefully curated product collections that really made the most of the material and showed it off in all it’s glory. There were two artisans stood out for us. Ballanby are a new company, launched in 2015, who hold the belief that ‘the traditional materials of Scotland hold a definitive place in modern style’. We couldn’t agree more and there collection of clothing and accessory are a fantastic demonstration of that. There use of colours is really brilliant and the quality and finish is really special. A favourite of ours was the orange Harris Tweed dog lead, it’s such a lovely piece that works so well with the material. It was really exciting to see such fresh ideas and design applied to such a historic material and we loved it. Our second artisan working in tweed is Catherine Aitken. Working from her studio in Leith, Edinburgh she has put together a really special range of products. Committed to using quality, local materials has been so worthwhile, with waxed cotton from Dundee, Fife linens and of course the Harris Tweed, everything oozes well made and attention to detail. Again colour was brilliantly used across her product range. Her range of bags, clothing and accessories were absolutely stunning and really showcased Harris Tweed in the best possible light. Pairing tweed and leather in her bags, both in muted and bright cloth, created some fantastic pieces that were so tactile and pulled us in from across the hall. The duffel featured above was really special but our favourite item was her twin strapped ‘Hepburn’ backpack in a grey herringbone tweed. These guys were great. Upcycled whisky barrels are transformed into a brilliant product range of whisky accessories and homewares. Again a family business (we love a family business) based in whisky country in the north east of Scotland it was clear they had a real care and pride in their product. Take a look at their full range here. Their whisky tweed clock was awarded second in the fair’s best product competition but it was their tea-light holders and bottle and glass holders that really caught our eye. Really cool pieces that are finished from the oak whisky barrels and all carry the fragrance of the whisky. A great addition to any whisky lovers collection. Our last product that really made an impact was the Baa stools. 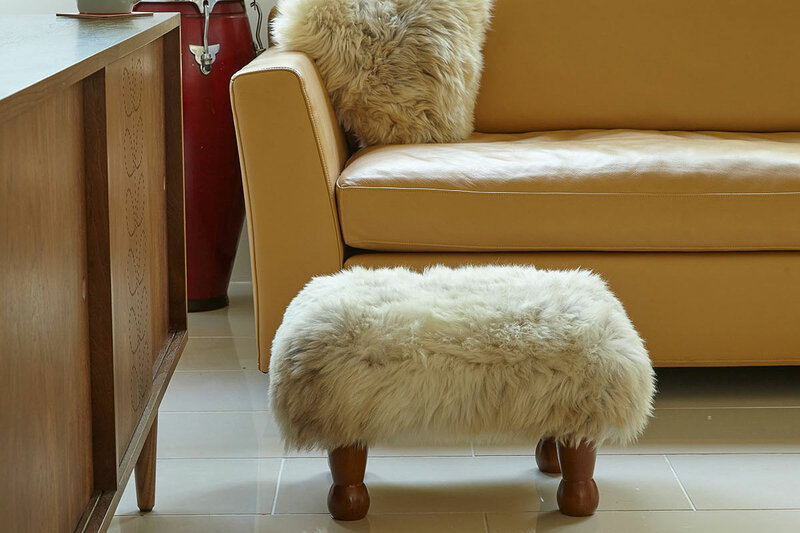 Fantastic foot stools and accessories made with real British sheepskin. They had bundles of character and were incredibly well made, a really great way to use such an abundant material and they just look so comfortable and cosy, brilliant for these cold, wild nights. Only downside was that the business is very proudly Welsh so not sure it quite fits with us. Maybe Artisans of Wales is in the pipeline. I’m sure it has as many great artisans as this fine land (well maybe not quite as many). There you go, a really great day at Scotland’s Trade Fair and we came with a lot to think about and a lot of business cards. We’re excited to see what can come from connections we made and excited to tell some more stories. If you spoke to us then thank you and to everyone else, we’ll see you next time.